The Blue Devils didn't seem to feel the heat in Atlanta, and not just because they were performing inside the air-conditioned Georgia Dome for the DCI Southeastern Championship on Saturday. The corps cruised its way to another gold medal with a score of 94.525, continuing an undefeated streak. The Cavaliers (2nd, 93.775) remained threatened by Phantom Regiment (3rd, 93.375), who took top honors in the Music caption. Meanwhile, Carolina Crown found a home away from home tonight, audience members shouting their appreciation during the corps' performance, helping to push the South Carolina corps to a 4th place finish with a score of 92.625. 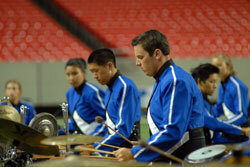 Blue Devils color guard captain Cory Robinson talks about the corps' Atlanta victory. Despite a close finish ahead of Phantom Regiment, the Cavaliers took their "Samurai" depiction to the limit with intense new visuals. Cavaliers director Bruno Zuccala said, "We're very happy with where we're at right now. We just changed our ending, and the first performance of the new ending was yesterday in Murfreesboro. Now it's time to continue to finalize the details and just get the corps members to perform. We're in the right place, and we're going to stay on our game plan. We're looking forward to the next two weeks to really tighten down the performance and really work on the performance qualities. The Cadets (5th, 91.375) have made some revisions to the story arc of their program "…and the pursuit of happiness." Sarah Jones, the principle character, is now celebrating the happiness of becoming a grandmother, her grandchild played at the conclusion of the performance by the newest member of the corps, who at nine years old is possibly the youngest Cadets member ever. The changes are a result of the corps' continual refinement of the show's "happiness" theme. "This organization has been taking risks for quite some time, and it carries through to today," said drum major Chris Castille. "Sometimes we don't get the response we go for, but we'll keep going at it and keep trying. It doesn't change the experience that we as members have with the drum corps. When you look behind the scenes, behind the uniforms at the experience members are having with the corps, I can't help but be happy. People are happy here, and we're still making that push." The Bluecoats (6th, 88.975) knocked out the Santa Clara Vanguard (7th, 88.100) again, the pair of them several points ahead of the Blue Knights (8th, 85.950). The Blue Stars (9th, 83.175) continued their surge and seem to have secured themselves as a contender for a spot in the World Championship Finals in Bloomington, placing ahead of the Boston Crusaders (10th, 83.125) by several hundredths of a point. The Glassmen (11th, 81.800) bested the Crossmen (12th, 80.750). Corps will be moving up the East coast this week, en route to Allentown, Pa. for the DCI Eastern Classic. The hallowed J. Birney Crum Stadium will play host to two nights of drum corps performances in the final Drum Corps International Premier Event before the corps set their sights on Indiana for the World Championships.